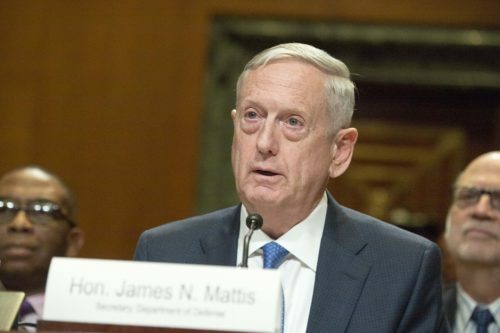 Defense Secretary James Mattis was supposed to send his recommendation regarding transgender people in the military to the White House this past Wednesday, but the recommendation has yet to be made public. But ABC’s Stephanie Ramos reports that the recommendation was privately given to the Trump Administration today. Last July, Donald Trump tweeted that the military would be banning transgender people. He followed this up with a memorandum in August calling for a ban, but it required the Defense Secretary to send in a recommendation on the subject by February 21, 2018 – this past Wednesday. The Justice Department also promised a judge that the Pentagon would have a new policy by February 21 in Stone v. Trump, one of the four federal lawsuits against the transgender military ban. Since the recommendation wasn’t made public, there was a lot of confusion this week. Anonymous sources told the Washington Examiner that Mattis sent his recommendation to the White House on Wednesday, but the Trump Administration and the Pentagon have not released the recommendation to the public. And the Defense Secretary’s spokesperson told reporters yesterday that the deadline was “self-imposed” and that Mattis needs more time to consider the available information. “This is a complex issue, and the secretary is taking his time to consider the information he’s been given,” the spokesperson said. “It’s an important issue, and again, he sees all of his decisions through the lens of lethality,” she added, referring to the U.S. military’s ability to kill people (not the number of people in the U.S. military who die). “Two U.S. officials with knowledge of the issue” told the Washington Post yesterday that the recommendation was supposed to be delivered at a meeting on Wednesday that ended up getting postponed. The anonymous sources expected Mattis to recommend letting transgender people stay in the military. The recommendation, though, is just that; Trump does not have to implement what Mattis recommends. But a public recommendation in favor of open service would go a long way to stopping Trump’s campaign to purge the military of trans people.